The further we progress towards launch of the adventure the more convinced I am that we are on the right path, that the time is right. 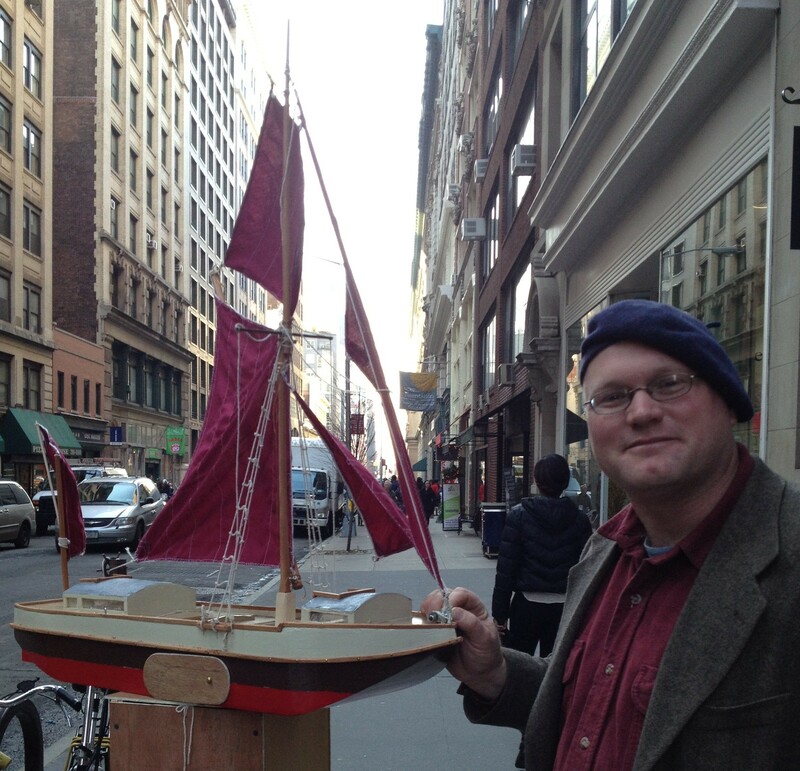 Last week I took to the streets of New York, with a whirlwind of eight sail-freight related meetings in just 36 hours. Something productive came out of every single one. You can see that the 1 12th scale model came along with me, on the train, on the subway, in cabs, and bumping on my back in a great unwieldy wooden box for many, many blocks. It was worth it. Though I am very happy to be home and to have that heavy box in the basement and the model on top of the piano again. The next time the sail freight barge goes to Manhattan, I want it to carry me there and not the other way around! I learned a lot about the logistics of the lower Hudson and the Port of New York too, including an introduction to mastering the tides and a tour of some likely docking spots. I noted, for instance, from the Metra North Train, that the ice in the Hudson River was moving north on a calm day. Closer to the sea, the forces of tide and current become even more powerful. It may actually be quite a challenge, for instance, to sail from the Hudson to South Street on the East River, because doing so requires that you fight a strong current either to reach the Battery or to work upriver from it. In addition, some of the world’s tallest waterfront buildings baffle the winds and make sailing problematic. Maybe that’s where we hire a tow, or else stick to the Hudson river. We’ll find a way somehow. Another thing I learned along the way is that a 36 foot boat is actually very small in this setting, and that all the beam-end stability we can get will be to the good. So we’re planning on upping the dimensions somewhat while still staying within the USCG inspection-exempt cargo vessel parameters. The revised dimensions get us a greater cargo capacity without additional crewing requirements, and with some other plusses too, like more headroom in cabins and below decks in the cargo holds. Another new development is that construction of the barge is now slated to take place start to finish here at Boundbrook Farm, where we have facilities nearly at the ready for a project of this scale. Naturally it makes it more convenient for me to work on and administrate the project too. Before too long we’ll be clearing the shop to begin this exciting project. No, it’s not out of a fetish for all things Pacific that we are leaning towards a junk rig to carry rice. It’s just the most sensible rig there is, particularly for river trading flatboats. And it’s not my fault the Chinese came up with the most practical ideas however many thousand years ago. At any rate you would never mistake it for a pleasure yacht, nor for a grease-covered diesel barge either. Nor even for a historic replica of a workboat from times past on the lake. It’s its own thing. And that’s okay by me. The graphics of the boat are generated from a 3-d model I made on Google SketchUp. They are pretty good for visualizing the craft and will have to do until we begin construction next year. This one shows how the mainmast can be used to winch cargo out of the hold and swing it to a dock.